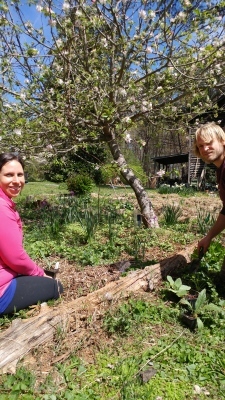 A 72-hour Permaculture Design Course (also known as a PDC) based in Greensboro, North Carolina. We offer the PDC in a total of six weekends, giving students time to digest and apply knowledge and skills during a portion of a growing season. This course will teach advanced design skills as students participate in regenerative ecological design. Through hands-on practice and discussion, students will gain the tools to understand pattern languages and use their creative potential to build resilient and healthy communities. The course will revolve around place-based design, specific to the piedmont of North Carolina; however, students will be able to apply knowledge to a broad range of environments -- from tropical to arid, high to low, east to west. Our lens of design is wide, encompassing both urban and rural sites. This 72-hour PDC will teach you how to transform and nourish yourself and your world. Permaculture principles teach how to mimic the resilient intelligence of nature, empowering you with tools to design thriving and abundant landscapes. These principles, when applied, play on the give-and-take of equitable systems of exchange. If you want to build community and socially just systems while gleaning food, medicine, and goods from the land, then this course is for you. This course is intended for anyone who wants to deepen their knowledge of the natural world and to learn how to collaborate with wild systems. The course will teach advanced design skills, and although we will be practicing place-based design, you should be able to apply your knowledge to a broad range of environments. Observing patterns in nature and learning to read landscapes will allow you to do this. Whether you want to design and consult professionally, are a teacher, ecologist, architect, city planner, farmer, parent, or simply a home gardener, you will leave this course with the skills to see and manifest possibilities for a sustainable future. If you are a Guilford College Student you are elligible to earn 2 credits for taking this course. Contact your advisor for more information.